Cauliflower is in season at the moment so, as you can probably tell, I've been experimenting with lots of recipes using it as a key ingredient. It seemed only natural to share my take on Cauliflower Rice, which is a staple within the health & wellbeing community. Use it in the same way that you'd use regular rice- I love it as a curry accompaniment thanks to the subtle yet zesty lime (which can be omitted if you prefer a plain "rice"). It's actually quicker & easier to make than regular rice, isn't as stodgy and as an added bonus, packs in an extra vegetable portion. 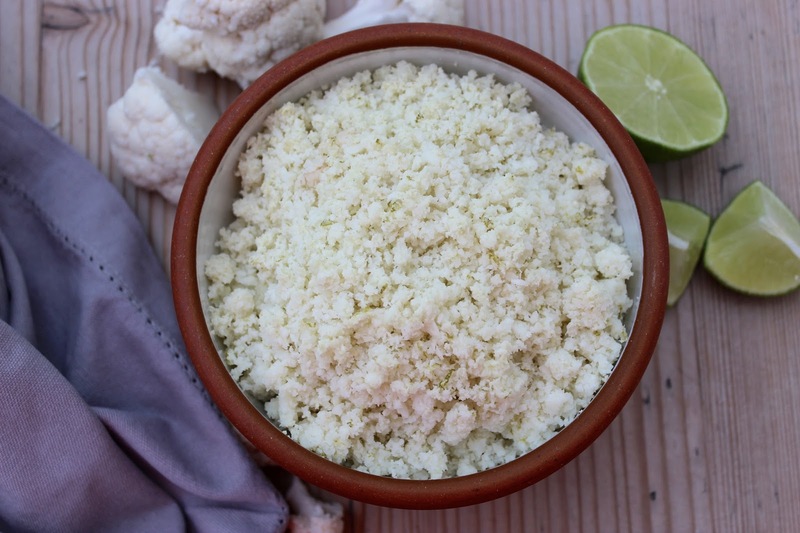 1) Place the cauliflower in a food processor and whizz until it resembles rice. 2) In a wok or large pan, heat the coconut oil over a medium heat on the hob. Add the cauliflower and stir fry for 2-3 minutes. Add the salt. 3) Add the lime zest and juice and stir fry for a further minute. Enjoy immediately. Raw Mango and Ginger "Cheesecake"